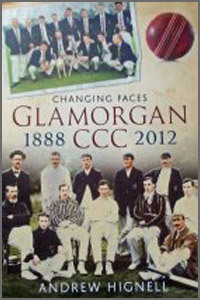 Glamorgan’s Mr.Cricket, Andrew Hignell, has added to his impressive array of books chronicling Glamorgan’s rich cricket history in this his latest book, Changing Faces Glamorgan CCC 1888-2012. In his latest venture, Andrew essentially gives us a potted history of Glamorgan throughout their existence and makes use of recent and rare photographs of team photos throughout their history. With each photograph comes written commentary as well as an introduction covering Glamorgan’s spirited history and top players some of whom represented England but others who were probably unlucky not to. Glamorgan CCC has now been in existence for 125 years and legendary players such as Don Shepherd, Johnnie Clay, Maurice Turnbull, Wilf Wooller and more recently ECB Managing Director, Hugh Morris, all feature. Reading this book should show the reader that, whilst silverware hasn’t been that frequent, Glamorgan have produced innumerable fine players throughout their history. Naturally, times and styles have changed and this book comes into its own through the team photos through the ages. Coming predominantly from Glamorgan’s archives, not all the photographers have, however, been identified which makes the book even more praiseworthy but this is a glorious, concise historical book of the Welsh county which will not only entertain but give, in its ninety-six pages, an interesting read for anyone interested in Glamorgan’s rich cricket history. Once again, Andrew Hignell has ensured that Glamorgan CCC has a decent cricketing literature behind it and I can highly recommend this beautifully bound and presented book.